During his speech, Georgian president Mikhail Saakashvili went on to rail against Russian national interests, casting the Kremlin as an empire that does not want peace between its neighbours. The anti-Russian and anti-Orthodox character of the Georgian president’s speech at the UN General Assembly forced the Russian delegation to leave the room, Russia's Permanent Mission to the United Nations said in a statement. 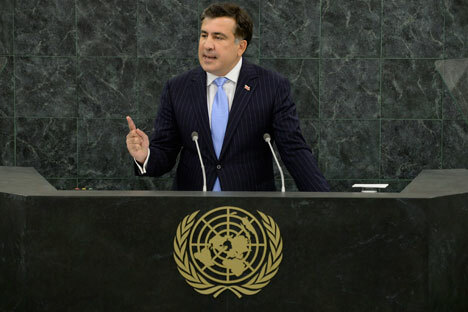 After the failure of the bloody venture unleashed by him in 2008 in South Ossetia, Saakashvili’s statements at the UN General Assembly have always been marked by crude anti-Russian outbursts, Russia's UN mission noted. Russian Foreign Ministry spokesman Aleksandr Lukashevich reportedly confirmed that the Russian delegation walked out the UN General Assembly hall in protest of remarks and assessments by the Georgian President. “In a sign of disagreement with the assessments, broadcast by Saakashvili from the podium of the General Assembly, Russian representatives left the room,” Lukashevich explained as cited by RIA Novosti. During his speech, Saakashvili went on to rail against Russian national interests, casting the Kremlin as an empire that does not want peace between its neighbours. Saakashvili accused Russia of occupying the independent states of South Ossetia and Abkhazia following the 2008 war with Georgia. “Do you think the Kremlin would agree to discuss the de-occupation of Abkhazia and South Ossetia, now that the government has changed in Tbilisi? Far from it! The annexation of Georgian lands by Russian troops continues,” he told the UN General Assembly. Saakashvili moved on to accuse Russia of dividing age-old communities. The Georgian President also attacked the prospect of establishing the Eurasian Union by 2015, a political and economic alliance of post-Soviet States. Even the Russian Orthodox Church became a target during the Georgian leader’s address.